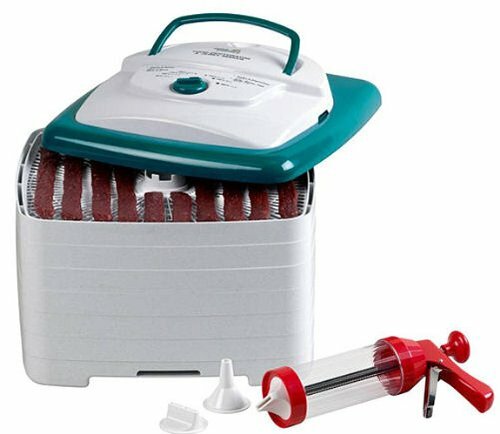 Open Country's Square Dehydrator and Jerky Kit is a great combo for making healthy and delicious dried food and on the go snacks. Save money and time when you stock your pantry with dehydrated banana chips, sundried tomatoes, homemade jerky and flax crackers! This large-capacity unit offers more room for drying and includes six trays. It features Open Country’s patented Converga-Flow air circulation that quickly dries your foods and doesn't mix food aromas, so you can dry meats and fruits in the same batch. No need to manually rotate trays. The thermostat adjusts easily for whatever items you're drying. Trays and jerky gun are dishwasher-safe and BPA free.